Much as we love the deserts and the mountains, we also feel irresistibly attracted to water and weather. The water's edge is exciting, producing an ever-changing discontinuity between textures and forms. Lighting changes as we near water, and the reflections, sounds, and rhythmic crashing of waves all blend into subconscious pleasure. In this gallery we pay tribute to the excitement, pleasure and romance of the water's edge. It suggests something eternal in our nature, and yet evokes immediate pleasure. You will find most unusual cloud, ocean, lake and river scenes here. In every case, the scenes are real, very real, and it is the art of digitography that has brought them alive. Be sure and check our other galleries as well; they overlap a little. For your convenience, we've placed only a few images on each page of this gallery. When you are ready, go to page 1 in this Gallery, or use the tags at the top to view other galleries on our site and place your order. 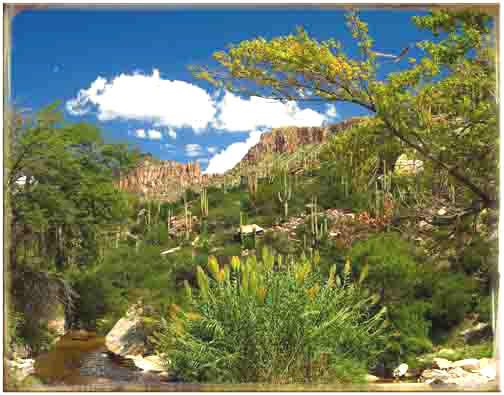 Sabino© is a canyon cutting through some of the most rugged parts of Arizona’s Santa Catalina Mountains. At times, the little stream flowing lazily through the canyon swells into a massive river. But between monsoons, the stream nourishes a riot of plant and wildlife. This would be a good time for your hike up the wonderful canyon. Sabino Reflections©. The Sabino Creek runs through a canyon to the east of Tucson. Rapids and waterfalls mark parts of the creek, but in other areas, the water reaches gentle pools beckoning you to come wading. Here the reflections of the high walls are met equally with the soft flowing grasses on the bottom creating a panoply of beauty and relaxation. Serenity©. Relax. Just sit back and gaze across the pond. And while you do, listen carefully to the bird song coming from the trees. Checking carefully, you will see a turtle or two as the float lazily with their heads barely above the water. And the flowers on the lily pads are just about ready to erupt. This is the life. 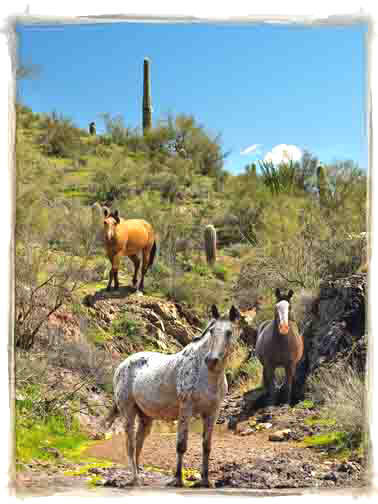 Time for a Drink© depicts a small group of open range horses found on the Tohono O’odham Nation land south of Casa Grande, Arizona. 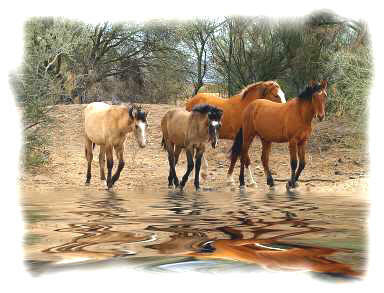 The horses have been resting in a bosque near one of the nation’s small villages, and they’ve been awaiting the tiny bit of desert rainfall that seems to fill this usually dry wash. It is a refreshing scene and we wanted to join them. Watering Hole©. Someone has been treating these horses well. But they don’t bear any brands, and they are here in the desert seemingly by themselves—no fences and no restraints--free. They are coming up to you now out of curiosity. Call them to you softly. One last comment: We know these images are tempting, but they are also copyrighted. Downloading for printing or other copying is expressly forbidden.